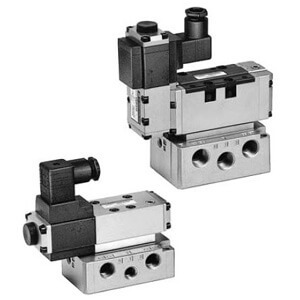 The 5 port electro-pneumatic proportional valve, Series VER can be used to switch and actuate a cylinder and to perform stepless pressure control of port A through electric signals. The VER2000 (direct operated type) is available with 1/4 or 3/8 port size. The VER4000 (internal pilot type) and the VER4001 (external pilot type) are available with 3/8, 1/2 or 3/4 port size. Thread types include Rc, G, NPT or NPTF. The VER is also available without a sub-plate.